We're just going to make a simple web page with a button, and this will be used to toggle the LED on and off. That's all we need to have for this, it's a simple build to get you into making a Node server and how to control our simple Nodebot with a web interface. With that being said, we've got a lot of work to do, so let's get started! To start this off, we'll be updating our Simple Nodebot and its code since we no longer require a physical button, since we'll be using one through HTML, JS and WebSockets. So, first thing we need to do, is remove the button and its wires from our Nodebot. Next, we'll remove the button's code in our index.js file. Again, we no longer need it, so we'll just delete all of our button code, including the toggle functionality. // [...] The rest of our code lives here...no more button code! We've now removed any instance of code for the physical button! Next, before we dive into making more code, we should some more settings to our .editorconfig file. This is opinionated, but I suggest using tabs instead of spaces when working in HTML. The size of the indent is up to you. One last thing we need to add is to our .flowconfig — some bits of our code need to ignored by Flow otherwise it will be a bit upset, so we'll update it with this line of code. Now if we add before a line of code //flow-disable-next-line, Flow will immediately ignore the proceeding line and won't give an error! Now we've set up our previous code for what's to come next! Let's get going and make our server and interface! With Express, we can build a web application that can serve our interface, and can handle requests as well as serve files easily. To do this, we add it to our dependencies with Yarn. We'll need to update our code in index.js as this will be our server file as well as our code for the Arduino, neatly bundled in one file. Let's make our Server! // Set the server to port 8000 and send the HTML from there. With our code above, we've imported Express and a Server module from the http package in Node.JS, which comes as a default. We then make a new Express application, and then make a new HTTP Server with the Express App. For this instance, we'll hard-code the Server to run on Port 8000 and listen for any requests. Now let's make our HTML to serve on the root of the Server! The HTML for this is quite simple, it's simply a button wrapped in a div element that acts as a container, and will be centered on the center of the page using CSS. Now we just need to apply some CSS to our content — we use a simple reset to our elements (note: we're making a simple project, we can be a bit dirty with our CSS! ), and use CSS Flexbox to completely center the button on the page. * Set to flexbox and make sure all items are aligned to the center. * Set styles for the button. Now we've made a our HTML and our CSS, we can set this file to show on root through localhost:8000. Update your index.js file with a line to display the HTML file when the user goes to the root. Another we should add is a line using our dist folder (which we'll get to) and display it as /static on the server. // We have a dist directory, but use '/static' to fetch it. // When the client is on the root, show the HTML file. One other thing we can do is watch our files for any changes, and allow the code to reload upon change so we can continuously edit and see the changes instantly. For this, we'll be using a dependency called Nodemon. To install Nodemon, we can add it to Yarn as a dependency. Now we need to update our start script in package.json. We'll be using Nodemon to execute babel-node and watch for any changes in the server code. "test": "eslint ./ && flow"
Now, if we run our yarn start script, it will start our Johnny-Five as well as our server, and run on port 8000! So, if we jump on our browser (I'm using Google Chrome), we'll see our simple interface of a big fat button in the browser! Now we've made our interface and our server, let's get on to making our client side scripts! Since we're writing in ES6 and Babel, we should use a bundler to compile all our ES6 code and make it work for browsers, especially since not a lot of ES6 is available in browsers yet! For this, we'll be using an awesome bundler called Webpack. To install Webpack, we need to install it as a development dependency in Yarn. We now need to make a file called webpack.config.babel.js, and we'll be writing our Webpack configuration in ES6, since we can. This is what will take our code written for the browser using ES6 and compile it to browser-friendly code. Our entry key is used to tell what file, or files, we want Webpack to take and bundle into our browser script. output is used define specifics for the compiled file. In this case, we want it to be compiled into a file called bundle.js and output it into a new folder called dist. resolve is used to find modules using aliases. For instance, modules imported via Node.JS are absolute to Webpack, so this helps resolve it. Another example is files called without a .js extension, and will accept the files without the extension. Now we've got an understanding of what Webpack does! The next thing we need to do is add a dev script. With this, we'll tell Webpack to bundle our client-side scripts, and when any changes take place, to re-bundle the scripts. We start off by importing the babel-polyfill package, which will provide supporting scripts for ES6 features in an ES5 environment. Next, we define an ledToggle constant that will find the button in the HTML document by its ID. Finally, since the LED is on by default on the server's end, we'll set it as the default on the client end. Now we need to make our client-side code to communicate with the server-side, so we can control our Nodebot! Let's take a deep dive into Websockets! Let's take briefly about Websockets. Websockets allow us to communicate events between two points, specifically a server and a client. This is really useful since the communication is instant, and does not communicate with low latency unlike HTTP. A great example is chat applications, some use Websockets to communicate between users instantly over specific rooms on the service! We're going to be using Socket.IO to allow our client-side code to control our Nodebot. We need to install two dependencies for websocket communication — the main socket.io library, and socket.io-client for the client-side. In our index.js file, we'll import socket.io to our server, and wrap our server instance into a new socket.io instance. Now when our Server is running, it will listen for socket communication on the client side on port 8000! Next thing we need to do is write events within our Johnny-Five code so when communication happens on the client-side our Nodebot will act accordingly! * When the client-side has connected, output the status to console. * Then, send the current LED status to the client-side. * When the LED is toggled from the client-side, update the lightOn variable. * Depending on the boolean sent, turn on or off the LED. // Log the current state of the LED. With the code above, we'll know when the client has connected to the server with a log to our CLI console, and will send (emit) the current state of the LED to the client (in case our LED is off when we view our button in the browser!). When the server receives an event called 'light-toggle', which we'll use for controlling the LED, it will set the lightOn variable to the value that has been sent, and logging if our LED is on or off. 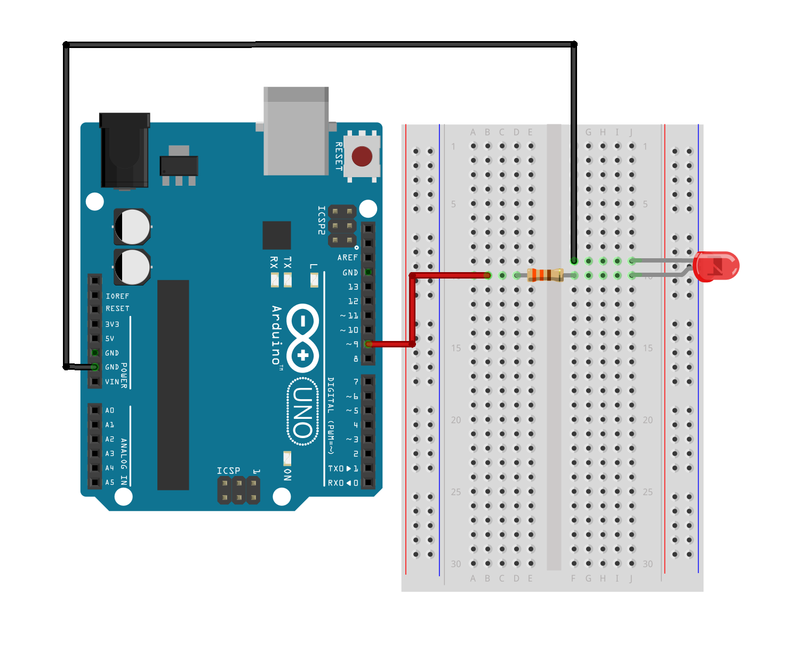 With the updated variable, this will turn our LED on or off when the button is pressed! Now for the client-side sockets — we'll need to make events for telling the server the client-side has connected, and receive the current state of the LED, as well as events for when the button is pressed. * On connection, tell the server that the client side has connected. * Upon connection, a 'light-state' event may be sent from the server. * Set the lightOn variable to the current state on the server side. // Get robot's current light state from the server side. * If the LED toggle button is found in the DOM, check when it's clicked. * server and update the robot's LED state. // Send new value down to the server. When setting up socket.io-client, we need to set it to our local server, which in this case would be http://localhost:8000. An simple way to do that is get the address from window.location.name, which will be the root URL for the server. We then tell the server, via websockets, that the client has connected, and will receive the current LED state, and update certain things if necessary. If the LED toggle button exists in the HTML, we can then listen for when it's clicked. Every time it is clicked, it will update the client-side lightOn variable, as well as the button's text, and send the new value to the server, which will then turn the Nodebot's LED on or off! Now that we've made all this come together, let's give our simple Nodebot interface a go. With our server running and Webpack compiling our code, let's head on over to http://localhost:8000 and toggle the LED on and off! Another little thing you can do is using a browser in a tablet or smartphone to control the LED using the simple interface we've just made, provided your device is on the same Wi-Fi network your computer, running the Node server, is connected to. Important Note: to access via your smartphone or tablet, make sure that you have allowed file sharing on your computer. You will then be able to view the web interface using your machine's hostname or IP address. If you're stuck on where to find your machine's IP address, use ifconfig on macOS or hostname -i on Linux systems. Next thing we need to do is make sure our code is clean and has no errors with ESLint and Flow — simply run yarn test and it will check our code. We should get no errors! Yay! Lastly, we need to make a production-ready, compiled version of our code. Firstly, we need to install a dependency called rimraf — which will delete our previous compiled code so we can make a clean build. Next, all we need to do is make a build script in package.json which will compile the code and make it production ready. Now, it's worth pointing out, this is just for practice, but also, when using our server code in production scenarios, we can't just leave babel-node running all the time as it's prone to memory leaks! Instead, we'll make babel compile the code and let that run continuously if we want to. We've also got Webpack to compile our client-side scripts as well. The last thing we need to do is make a script to run the compiled code for our server. Simple make a production script in package.json and tell node to run our compiled code. Now if we run yarn production, our Server and Nodebot will be up and running, ready to serve our interface and toggle with! Stuck with any of the above? If you're stuck with any of the code above, don't worry — I have attached a Git repository containing the final code, so if you're unsure about anything, you can happily use my code as a reference. You didn't honestly think that was the end of the series? Gosh no! We're going to take our code to the next level after this! We'll still be making simple Nodebots, but we'll also be using a JS Framework for our Interface and use it to make a small Web App, as well as using client-side application states to control our next Nodebot! It's going to be awesome! Can't wait for the next part? If you're really excited for the next part, you can get it early by pledging to my Patreon! With Patreon, you can get perks such as behind the scenes looks and early releases of creations and articles, as well as patron-only posts! Alternatively, if you want to support my work, I also have a PayPal! Be sure to follow me on Twitter, Like my page on Facebook, or subscribe to my mailing list to get updates! Simply remove the Button from the previous circuit, we only need the LED now! The full code for the Simple Nodebot in this series — feel free to use as a reference!